There were speculations that designer, Umit Benan, would part away from the famous Trussardi leather goods brand, which he did. So in February, Gaia Trussardi, granddaughter of Dante Trussardi (founder), was appointed as creative director of the entire main line. Gaia is young, but her youthfulness doesn't seem to interfere with her skills, because her debut for Trussardi men's spring 2014 collection was quite a strong one. Knitwear pieces had a rugged appeal in colors that seemed to come from the hot desert. By far, her most special items here were her shorts - crafted in leather, ostrich, and snakeskin - that couldn't be allowed to be described as "average." She managed to deliver light touches of earthy leather button-down shirts that could have a potential customer wanting several of them. Her cropped trousers, such as one in a leather snake print, were pleasing in some ways. She also thought about offering options to the client who prefers to wear a luxurious crisp white trouser paired with a super light linen shirt and jacket. One gray tank top done in leather called for summer to arrive. Leather or not, the collection had Trussardi's elements. Iceberg can be mostly identified by its cool color-block designs. Its spring 2014 menswear collection couldn't let go of the brand's signature. 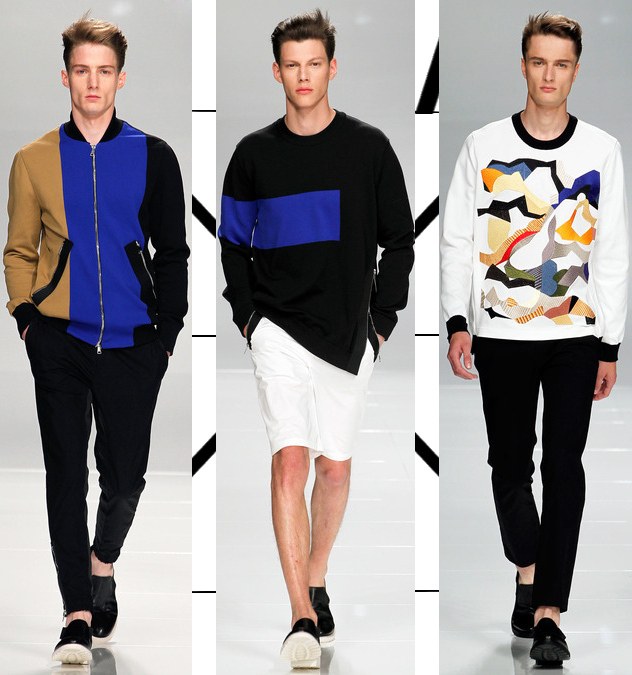 Federico Curradi sent another great selection of fresh color-blocking designs. His focus this season seemed to be that of the zippers. There were zippers attached everywhere: across sweaters and jackets, side seams of shirts, hems of fitted trousers, pockets of white and black shorts, and shoulder sleeves of t-shirts. All added a cool factor to the the collection. His origami stitched patches of colors on sweaters felt appropriate to wear any season. 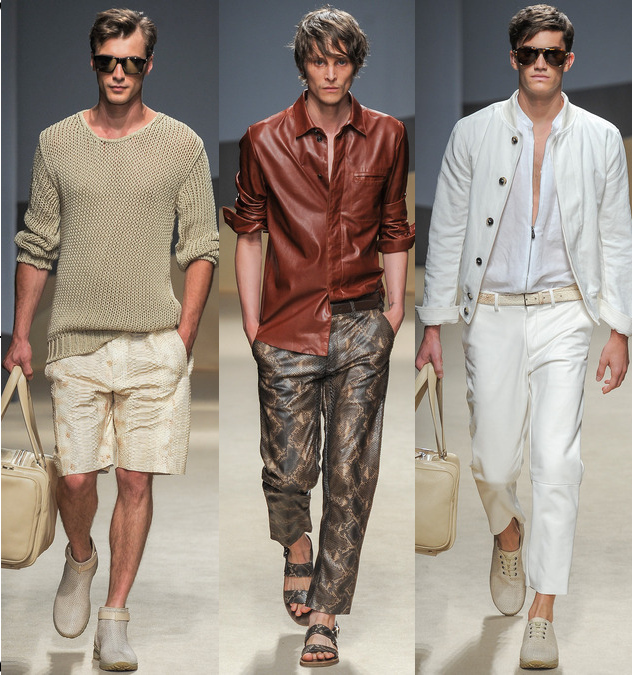 "Formalwear is imbued with the efficiency and comfort of sportswear," were Massimiliano Giornetti's words towards its new spring 2014 menswear collection for Salvatore Ferragamo. It was in fact noticeable what Giornetti was trying to describe previously. Clothes felt light. Comfortably infused with a spring of colors - light green, caramel, white, khaki, sky blue, orange, and intense blue - that sent a futuristic silhouette to how athletic guys will dress. The play of numbers stitched in tank tops, sweaters, and coats were that of which a sports guy would feel devoted towards. His shorts were crisp and somewhat casual-formal when brought with effortless colors of suits, whilst trousers had a clean cut with those folded layers between the knee. Ones to watch were Ferragamo's techno anoraks. Gladiator leather-type sandals may have been somewhat doubtful. Overall, this was a collection that understood what sportswear should luxuriously appear like. 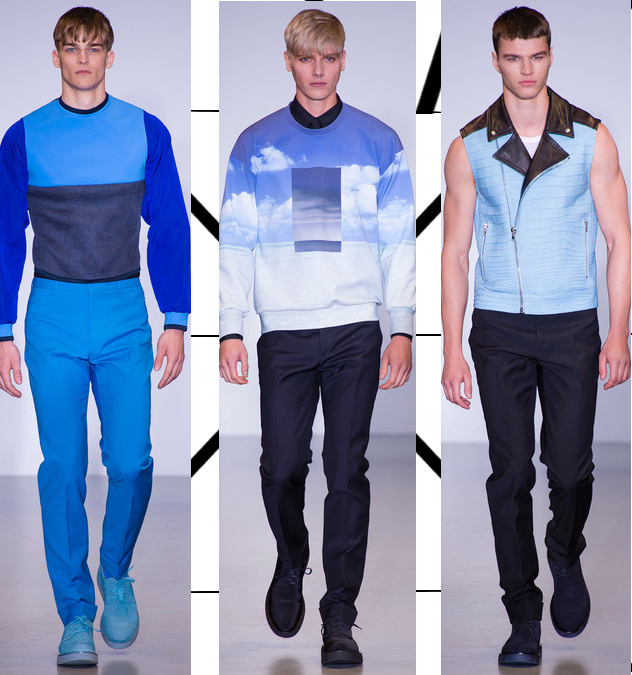 Calvin Klein reminded one of how the future of menswear fashion could look like in those intensely blue numbers; it may have been the hairstyle of the first few models that felt we were in another dimension. Italo Zucchelli's spring 2014 menswear collection was about the "celebration of the summer sky, and the simplicity of the summer wardrobe." The sky is blue, and blue was the color that gave life to most of the high-tech collection. Zuchelli has been a long respected designer, who understands clearly the codes of the Calvin Klein aesthetics, but over the time he has made his signature techniques much more visible. He knows how to choose the best sophisticated high-end fabrics, giving it a sharp futuristic tailoring technique that never fails to disappoint. He began with a series of tech blousons and sweaters - cut in mesh - that were paired with fluorescent wool pants that said tough boy. But his cloud print sweaters and t-shirts, and sunsets, were what most people were talking about. He also presented three super authentic crocodile jackets, but one baby blue crocodile vest screamed more luxury than simplicity. Leave it up to Miuccia Prada to make your vacation the most interesting of all. It takes time to adjust to the lifestyle Prada prefers to be: ugly-chic. But it is that ugliness that magically turns into a beautiful piece of art that has made the brand so successful over the years. 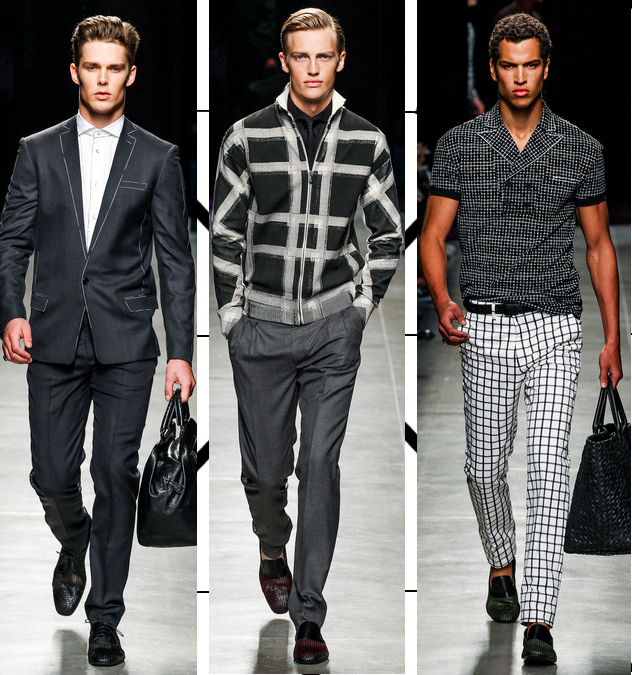 And it wasn't too difficult to fall in love with these collection if you're a huge Prada fan. The show began with a tropical print silk shirt paired with a soft tailoring suit and trousers. Most of her suits had a very relaxed silhouette, but her silk numbers - blousons, tropical shirts, and vibrant shorts - had a dominating factor you had to go back again to enjoy. It was as if Miuccia was describing the liberation of man who seeks to advance to the next level of fashion with full confidence. A salmon print blouson with a semi-drawing of a woman had a seductive power. And her knitwear pieces - cut in a smaller size - came in various phases of nature scenes that went from a joyful mood to a calm satisfying state of mind with models sprayed with water to give the show a hot summery season made with love. 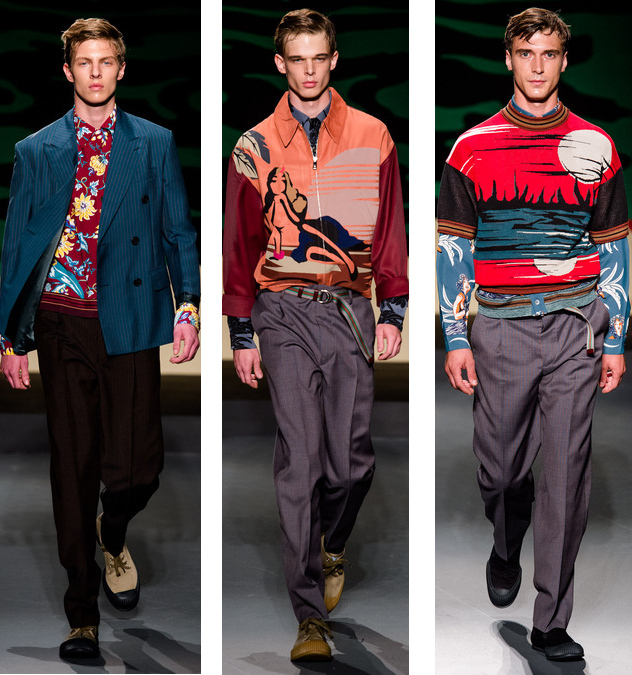 The atmosphere was everything to give Miuccia Prada a huge applause for her new innovative trend towards menswear fashion.